We've had an exciting week... construction started on our new house! It really just looks like a lot of dirt moved at this point, but nevertheless, so exciting and it's starting to feel very real! I thought it'd be a good chance for me to share our house plans and to post some of our progress photos. Some of you asked where we are living in the meantime. My husband's parents graciously let us move into their basement and even cleared out a huge section of their basement storage to store all of our belongings. It's very cozy and spacious down there and we really appreciate our temporary home. Justus is about five miles from work right now, but now we're also about 30 miles from our "home". So every Friday we head to my parents house, where we spend the entire weekend. This way both set of parents get a break from us. ;-) Ha! The photo above is the house plan we chose! I always thought given the opportunity to build a new house, I would want to choose a farmhouse plan. But after spending hours and days looking at house plans, we never could find a farmhouse plan with the floor plan we were looking for. 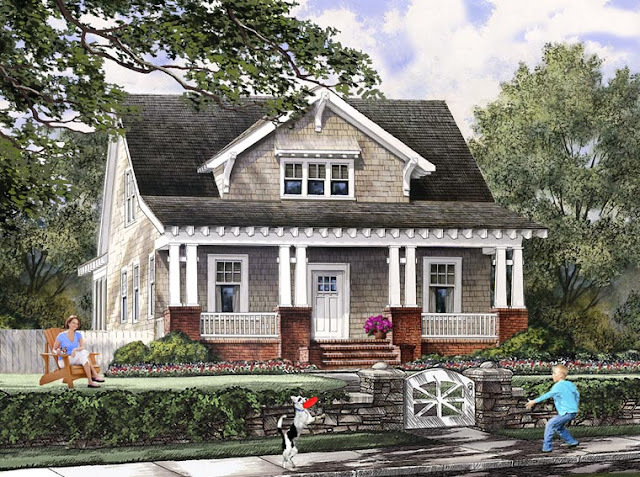 Justus actually found this bungalow craftsman house plan, and we both knew this was it. We love the open floor plan, the use of square footage, and it just felt like "us". The exterior will look a bit different than the picture above in the use of materials. The sides of the house and the back will be brick, and the front of the house (porch) and dormers will be 4" hardi lap siding (painted a creamy white, of course!). We have a few other minor changes we are making... but hopefully the end result will be as charming as this rendition! :-) All the decisions make me nervous! One of my favorite side elevations is this side, with its chimney, side porch and dormer. This side will face the pasture and we will enjoy its view from the kitchen, dining and living room. The first floor plan above... we have made some minor changes (like extending the great room wall out), but for the most part it will look as pictured. And the second floor plan. The rec room will be framed, but we will finish the rest ourselves. Again, just a few minor changes (such as a tub/shower combo in the bathroom). Friday the footers were dug! So exciting for all four of us to see the first bit of progress. Although our temporary living situation has been going well, we all miss having a home of our own. 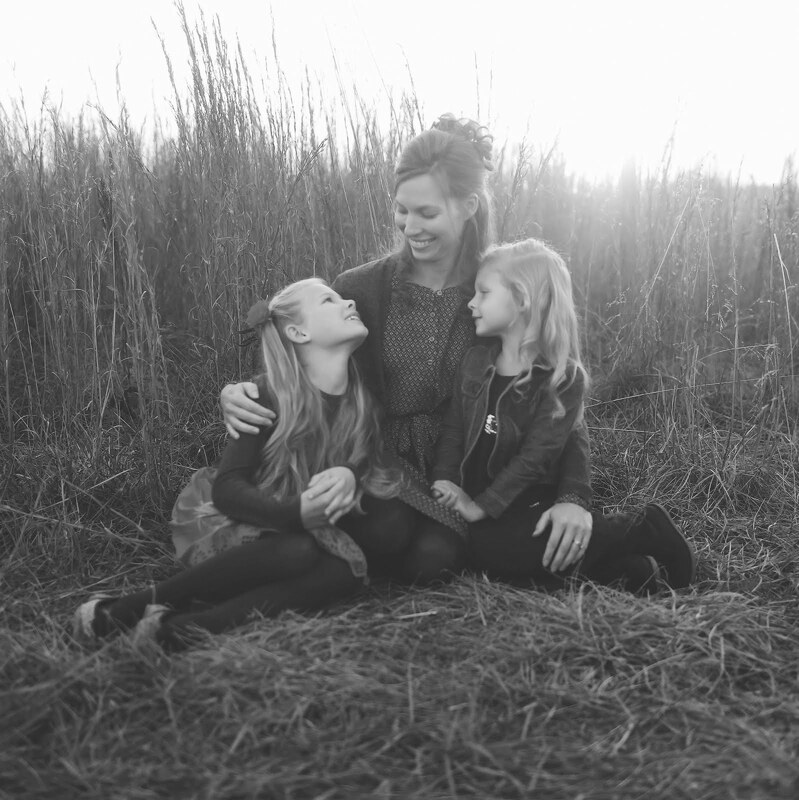 The transition has been a little hard for our girls, so I was particularly anxious for them to see where their new home would be. :-) As you can see in the photo above, the main reason we moved was so that we could have all this space for our family! We are so looking forward to having a spacious yard and being a good distance from the road. The concrete for the footers will be poured this next week. This week we also got power to our lot! The temporary pole is in, and eventually will be underground to the house. Although we hired a general contractor, one of the jobs we (or my dad and Justus) did ourselves is bringing water to the lot. As you can see, this was a huge undertaking and was made all the more difficult by all the rock they encountered. But today water is officially to the lot!